Saturday 8/9/14 – Michael Brown is shot and killed by police officer Darren Wilson. Brown was walking home from a convenience store to his grandma’s house, when the officer stopped him for jaywalking and a scuffle ensued. Witnesses say that the officer shot Brown as he fled with his hands up in surrender. A crowd quickly grows, shots are fired into the air and a dumpster is set on fire. Police respond with an armored riot vehicle, a helicopter, dogs and assault rifles. As anger on the streets grows, the police are forced to retreat from the scene. Later accusations are thrown against Brown that he was a suspect in a robbery earlier in the day. Sunday 8/10/14 – In the evening crowds gather for a prayer vigil held at the site of the shooting, in the Canfield apartments. The crowd starts a march down to W. Florissant where police have massed. The protesters confront the police line, yelling insults and throwing things at the police. Three or four police cruisers attempt to drive through the crowd. Quickly they are surrounded and people kick and smash out the windows of the cars. After the police make it out of the crowd, the street is free of police and people begin to celebrate. The mood is incredibly festive. Some people march down to the Quick Trip, while others attempt to march to the police station, but are met by a wall of police. The QT has its windows smashed in and people flood in to loot the store. Quickly the outside is covered in “RIP MIKE MIKE,” and anti-police graffiti. A few celebratory shots are fired into the air. People openly drive cars onto W. Florissant and fill them with looted goods. Police respond with tear gas, but for the most part remain clear of the crowd. The festive crowd remains in the street late into the night. By the time things dwindle down the looting has spread to twelve businesses, with multiple dumpsters are on fire. A fire completely engulfs the QT and reduces it to rubble. Two police have been injured by rocks and bottles. 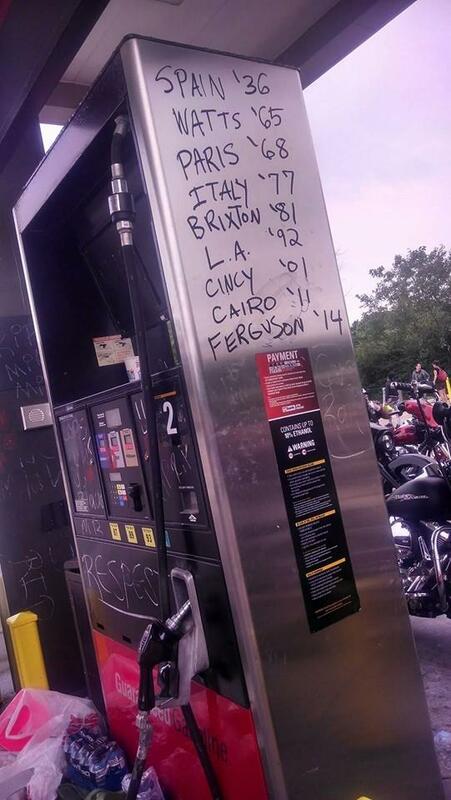 Monday 8/11/14 –Crowds attempt to gather at the looted and burned Quick Trip. As soon as people begin to block the street they are attacked by riot police with armored personnel carriers, tear gas, rubber bullets and a variety of “less lethal” weaponry. The cops set up static lines on either end of W. Florissant while neighborhood residents and others yell and throw stones in an effort to force the police to withdraw. Neighborhood residents come to the aid of those from outside the area, giving them directions and leading them through the surrounding neighborhoods. Mild street fighting continues late into the night as protestors discuss the need for continued determination, more supplies (gas masks, molotov cocktails), and a mutation in tactics such as strikes and walkouts. Looting threatens to spread as smash and grabs occur or are disrupted in South St. Louis and the Gallaria Mall in West County. Police are pre-emptively deployed in dense commercial districts downtown (Washington Ave.) and in University City (the Delmar Loop). Tuesday 8/12/14 – Again people attempt to stage a protest at the QT and are attacked by militarized riot police. Some of the crowd marches to a rally at a local church where Al Sharpton is speaking. Outside the mood is tense. Hundreds of people are milling around the yard of the church, the side walk and the street, holding signs, yelling, and talking amongst each other. Cars drive up and down the street honking their horns in support. Without the presence of a visible enemy, some protestors turn on each other increasing the underlying racial tensions. Fueled by a vocal minority, white protesters are scapegoated for the conflicts of previous nights though later in the week the individuals involved reconcile their disputes. Late in the night, five people are shot, one by the police. Wednesday 8/13/14 – A familiar scene plays out on West Florissant. Crowds gather and are attacked by police. This time some protestors come prepared. A small number of molotov cocktails are thrown at the police lines along with rocks and tear gas canisters. This change in tactics (the use of firebombs) represents a dramatic escalation that threatens to push the situation past a tipping point. Thursday 8/14/14 – As President Obama references the events in Ferguson, Missouri Governor Jay Nixon removes the County Police from control of the protests and puts the State Highway Patrol in charge, led by Ron Johnson, a black officer. Johnson promises a less heavy-handed approach to dealing with the demonstrations. Protesters fill W. Florissant early in the day with cars, barbecues and bodies. Since the QT was burned, it has been a gathering point, but today is the first day it feels like the epicenter of a movement. It has transformed from a gas station, to a burned building, to a thriving park where people exchange ideas, make friends and prepare for the coming fight once the sun goes down. The mood is incredibly festive, cars blast music, some loaded down with people screaming and shouting out of the windows or on the hoods. The half mile strip of W. Florissant is transformed into a victory parade ground. Three separate times the police attempt to enter the crowd and are chased out. Even the commanding officers are surrounded, aggressively shouted down and chased to their cars and out of the demonstration. One can smell the fear from the officers and see the sweat pouring from their foreheads. Despite to efforts of wannabe politicians, the presence on the streets lasts long into the night while people celebrate winning the streets from the police. Friday 8/15/14 – The Ferguson Police Department releases surveillance footage of the “robbery” Mike Brown allegedly participated in at Ferguson Market. During the day, the scene on the street is incredibly festive again. By evening the mood has shifted as a confrontation unfolds between protesters and police guarding the store. Tear gas and flash bang grenades are used by the police in a effort to disperse the rowdy crowd. Instead of running away, protestors fight back and shoot into the air. A group of about 100 confronts police lines, throws bottles and rocks and holds ground against overwhelming numbers of police. Ferguson Market is the epicenter of renewed looting. Saturday 8/16/14 – In response to the looting the night before, Governor Jay Nixon declares a curfew in effect for Ferguson from the hours of midnight to five in the morning. Almost immediately there is a public call by activists to resist the curfew. The QT quickly fills up with people, eating, giving out water and talking about what to do next. Although the crowd largely seems intent on resisting the curfew, a few “leaders” from the New Black Panther Party and the Nation of Islam successfully scare most people from staying in the streets past midnight. As the clock hits midnight, the NOI, NBPP and even the activists that put out the call to resist the curfew are nowhere in sight. The only people left, while relatively small in number, are determined and defiant. Armed with pistols and molotov cocktails, some of the crowd has assembled under the awning of a boarded up barbecue restaurant and are preparing to attack the police when they advance. Around 45 minutes after midnight the police begin to slowly clear the streets. When protesters refuse to disperse, the cops rapidly fire tear gas and smoke grenades into the crowd. Defiantly people pick up the gas canisters and throw them back at the advancing police line. Multiple protesters collapse in the street and are quickly carried to relative safety by others. Some people rip up chunks of asphalt from pot holes while others grab rocks from storefront landscaping but they are no match for the heavily armored police vehicles and the crowd is pushed back. Out of nowhere a lone cop car with its sirens on screams down W. Florissant from the opposite direction of the advancing line of riot cops. In the ensuing panic, protestors run down side streets as a heavy burst of gunfire rings out from people posted up underneath the awning. Chaos ensues as the police car loops back and more protesters flee, running straight into the crossfire of the people under the awning and the advancing police line. One protester is hit twice by gunfire, either by the cops or by friendly fire. Quickly he is loaded into a car and rushed to the hospital. Sunday 8/17/14 – Looting and conflicts with the police continue and spread as protestors refuse to give up and go home. Hours before the curfew is imposed violence breaks out, in what is called the worst night of rioting by the media. The past few days have only increased the audacity of the crowds. This time protestors attempt to march on the police command center located in a nearby strip mall. Molotov cocktails are thrown at police, and gunshots are reported. The police respond with heavy amounts of tear gas and rubber bullets. Eventually pushing the crowds back down the street. The looting becomes more dispersed and wide spread. With looting being reported in multiple locations miles away from the QT. Monday 8/18/14 – After the unrest Sunday night, Governor Nixon declares a State of Emergency and calls in the National Guard to protect the police command center. The police state that they will not allow crowds to assemble and that all protesters will be forced to continue moving along the street or be arrested. The curfew, however, is lifted from the city of Ferguson. Police block off W. Florissant to cars and set up checkpoints at both ends of the strip. Many of the side roads through the neighborhoods that lead down to the strip are blocked off as well. This new police tactic is a blow to protesters who had previously used the side roads to flood onto W. Florissant and escape once the evening got too hot. In the afternoon Nelly arrives on the scene, telling people they have options, someone in the crowd shouts back “you have options, you’re rich!”. As darkness approaches the crowd swells and people begin to defiantly march in the streets. As a standoff with the police line develops, rocks and bottles fly through the air. In response peace marshals link arms and form a line between the march and the police, attempting to push people back off the streets. Despite the efforts of the “peace police” some continue to confront the police throughout the night. One woman rips a “DO NOT ENTER” street sign from the ground and carries it into the road to face off with the police, occasionally dropping it to walk back into the crowd and check on her baby. In response to a rumor of shots fired, the police fire a barrage of tear gas into the streets. Fearlessly people throw the gas back, but the amount of gas in the air makes it nearly impossible to stay on W. Florissant and protesters fall back towards Canfield. More shots are fired, more tear gas fills the air, and some in the crowd work together in an attempt to set the barbeque joint on fire with molotovs and bottles of gas. Others attempt to create a small burning barricade to block the street and disperse the tear gas that fills the air. An armored car forces a further retreat into the neighborhood as people attempt to create barricades in the streets and defend the neighborhood. Tuesday 8/19/14 – For the first time in over a week, police and their political counterparts succeed in imposing order on W. Florissant. Despite a large and intimidating police presence people continue to demonstrate their anger and sadness by marching up and down the street. Members of the Nation of Islam, church leaders and liberal activists urge, shout and push people onto the sidewalks and away from police lines. Some small conflicts erupt, but they do not get out of control. This trend continues for the next few nights.